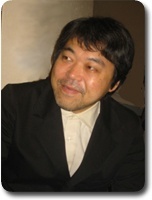 Yuji Nomi is a music composer/arranger, born in 1958 in Tokyo. Started his music activities at several art gallery by making multiplex recorded music with a synthesizer for his friend's art performances. Coincidentally, those music were noticed by Ryuichi Sakamoto, then Nomi has released his LP, Oshare TV from MIDI record in 1986, under the supervision of Mr.Sakamoto. After then, joined making/arranging music for the films produced by Mr.Sakamoto such as Adventures of Milo and Otisi, Wings of Honneamise. Also joined as an orchestrator for The Last Emperor the film. Having made film music for Whisper of The Heart (Mimi O Sumaseba) the film by Studio Ghibli in 1995, then he also made music for two short films by Miyao Hayazaki, Koro No Oosampo and Kujiratori, for the Ghibli Museum of Tokyo in 2001. And made Ghibli's film music again in Hiroyuki Morita's The Cat Returns (Neko No Ongaeshi).